The report “Concrete Admixtures Market by Type (Superplasticizers, Normal Plasticizers, Accelerating Agents, Air-Entraining Agents, Retarding Agents, Waterproofing Agents, & Others), & by Application (Residential, Non-Residential, & Infrastructure) - Global Forecasts to 2020”,analyzes the global concrete admixtures market with respect to market drivers, restraints, opportunities, and challenges in different regions. Browse 81 market data tables and 44 figures spread through 165 pages and in-depth TOC on "Concrete Admixtures Market by Type (Superplasticizers, Normal Plasticizers, Accelerating Agents, Air-Entraining Agents, Retarding Agents, Waterproofing Agents, & Others), & by Application (Residential, Non-Residential, & Infrastructure) - Global Forecasts to 2020"
The drivers identified for the concrete admixtures demand are growing infrastructure requirements in developing economies, improving economics of construction, and shifting preferences of population towards urbanization. The growth of concrete admixtures is mainly driven by the growing requirements for housing and infrastructure in developing economies such as India, China, Brazil, UAE, Saudi Arabia, and Egypt. It is also influenced by consumer awareness, need for durable and aesthetic civil structure, and other benefits achieved in making concrete structures more economical for contractors and other stakeholders.. The impact of improving quality and economics of construction is expected to remain moderate due to increasing consumer awareness about benefits of admixtures. The impact of growing urbanization trend is expected to be low-to- medium, due to anticipated saturation in the residential housing. Asia-Pacific is the largest market for concrete admixtures, both in terms of volume and value, followed by Middle East, & Africa (MEA) and Europe. The key players in this market are W.R. Grace Company (U.S.), BASF SE (Germany), RPM International (U.S.), The Dow Chemical Company (U.S.), Sika A.G. (Germany), Fosroc International (U.K.), Mapei S.p.A (Italy), Chryso SAS (France),and Pidilite Industries (India), among others. 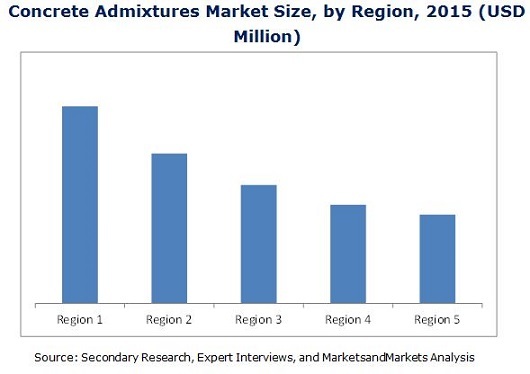 The concrete admixtures market, in terms of value and volume, is estimated by considering the current and future estimation according to the economic and industrial outlook. This analysis also covers important developments, expansions, partnerships & agreements, and mergers & acquisitions of the leading global companies. The market size, in terms of value, of concrete admixtures is estimated to be USD 11.68 Billion in 2015 and is projected to reach USD 18.10 Billion by 2020, at a CAGR of 9.15% between 2015 and 2020.